In the end, it doesn’t matter how this drink tastes. It matters only that you documented your having experienced this drink, thereby proving you’re an active participant in the cultural conversation. It matters that your social circle is aware of the fact that you spotted the Starbucks Unicorn Frappuccino, soon to be as fleeting and mythical as the creature that gives it its name. Starbucks’ Unicorn Frappuccino is the first mass-market beverage explicitly created for Instagram users. That the drink is only available for five days (Wednesday, April 19 through Sunday, April 23) underscores its exclusivity, meaning if you don’t provide digital evidence of having sampled it within this window, you’re not cool—now go home and listen to your Gordon Lightfoot cassettes. It was designed in Amazing Technicolor Dreamcoat hues, colors meant to explode your retinas when you slide the saturation setting to the far right. Visual shock (and proper rule-of-thirds composition) will spur others to click the heart below your picture, validating your social standing and existence. The press release Starbucks put out includes such flavors as “pink powder” and “sour blue drizzle” and “sweet pink and sour blue powder topping.” These aren’t foodstuffs found in nature, but rather conjured with numbers and formulas inside sterile labs. But here’s the thing: You know exactly what “sour blue drizzle” and “sweet pink powder” taste like, because much of what we grew up eating was similarly concocted by branding departments and people in white lab coats. 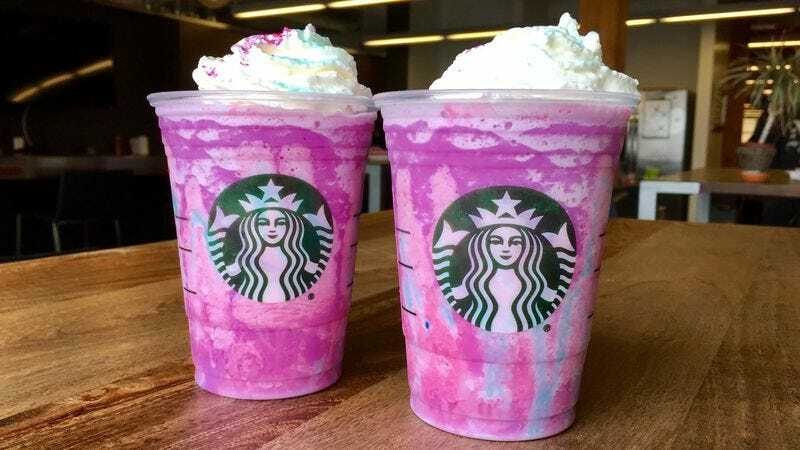 In that way, the very now Unicorn Frappuccino is also a blast from your past, a greatest-hits of the crap you ate at age 8: Trix cereal, Cool Whip, Starbursts, Sour Patch Kids powder, vanilla soft serve, all blended to look like a Lisa Frank Trapper Keeper. Your first instinct will be to not stir this drink, even after taking multiple photos and applying necessary filters, to preserve its aesthetic appeal. If you drink it as you received it, then how it tastes depends on where you insert the straw. One sip could be cloyingly sweet, another could have a pleasant sour streak, another pure vanilla cream. Stirring everything together transforms the drink from a dull lavender to a hot magenta, and makes it taste like a berry creamsicle. Though the Starbucks Unicorn Frappuccino is but a faddish pop cultural artifact, gone as soon as it arrives, it nevertheless invites some lasting philosophical questions. For example, does it matter if I, a reviewer, found this delicious or repugnant, since either way, it’ll be gone after Sunday? Is it creepy that the Starbucks marketing machine might be using its consumers as tools in some sick brand-awareness case study, or merely par for the course? What drives us food writers to overthink and overintellectualize what is, in essence, a plastic cup of sugar and ice? Why do they do it? Why do we do it? And deep down, is this a case of it not mattering whether I liked this drink, but rather, whether you liked me for liking this drink? Alas, I don’t have the answers. All I have is a sticky, empty cup and a need to fill it with alcohol.